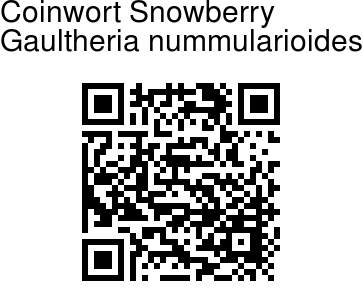 Coinwort Snowberry is a small prostrate shrub with oppositely arranged, small ovate-round leaves, and brown bristly stem, bearing black berries. Flowers are tiny, about 4 mm, reddish to nearly white, spherical, borne singly in leaf axils and pendent. Sepals are broadly ovate. Leaves are 1-1.8 cm across, with rounded bases. They are hairless above but have bristly brown hairs on the underside, and often on the margins. Stems are spreading, much branched, densely leafy. Berry is black, succulent, 6 mm across. 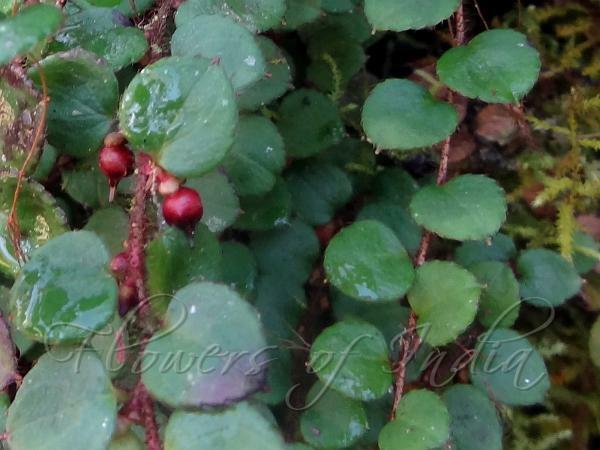 Coinwort Snowberry is found on rocks and banks in the Himalayas, from Himachal Pradesh to SW China and Burma, at altitudes of 2100-4000 m. Flowering: July-September.